♥There NO touch function with screen, Only touch button . ♥All of our products are inspected strictly before send out . We offer one-year warranty and whole life after-service, please contact us if you have any trouble when using it. ♥TOGUARD is a registered trademark protected by EU and US Trademark Law. TOGUARD products are sold by authorized sellers only. 【Visual Enjoyment】: The super 7" inch TFT monitor display screen with HD 1024*600 high resolution delivers excellent detail, work stable and anti-jamming, bright saturation image and high color reduction give you a pleasant visual enjoyment. 【Portable & Mini Size】 : This small monitor only weight 1.32lb/600g, super slim design convenient for you to carry it in your handbag and take use whenever need it , specially suitable for home and business use. 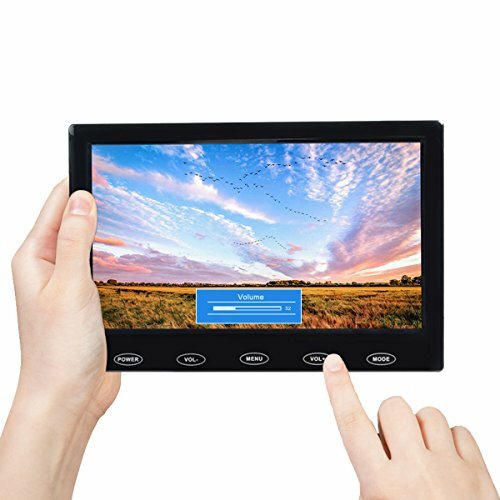 【Very extensive use】: This small portable monitor provides a rich set of video input options - including 1x HDMI port for Raspberry Pi, DSLR, PC or other devices with HDMI port use. By plugging with a TV-stick, you can use it as a small TV. 1x VGA port for PC use. 1x AV port for DVD,VCD,TV-Box or CCTV Security camera use,etc. It also can be perfect used as gaming monitor. 【Excellent workmanship】: The design of touch key make the operation more convenient, NO button damage issue for after long time use. Multi language OSD menu can complete various settings, such as rotating the view of screen. 【Energy Efficient】: Environmentally friendly, the TOGUARD LED CCTV security surveillance monitor is designed to meet Energy Star standards. Automatic sleep function reducing energy costs and conserving energy.